(January 11, 2019) — A new program that allows Georgetown University medical students to complete an elective “rotation” in a law clinic is yielding immediate results for underserved families in the Washington area. Leveraging their training, a Georgetown University medical and law student teamed up to help a mother obtain the appropriate learning accommodations for a child with special education needs — a task that while crucial, can be relentlessly tedious for any family — much less one that might already be struggling to make ends meet. Serving clients who face a range of complicated challenges just like these, the Health Justice Alliance is a medical-legal partnership between Georgetown’s Law and Medical Centers that educates students on the use of the law as a tool to improve health and well-being. Founding co-directors Vicki Girard (L’87) and Yael Cannon, both professors at the Law Center, worked with medical director Eileen S. Moore, MD, to create a four-week elective rotation at the Health Justice Alliance for students on the School of Medicine’s Health Justice Scholars Track. 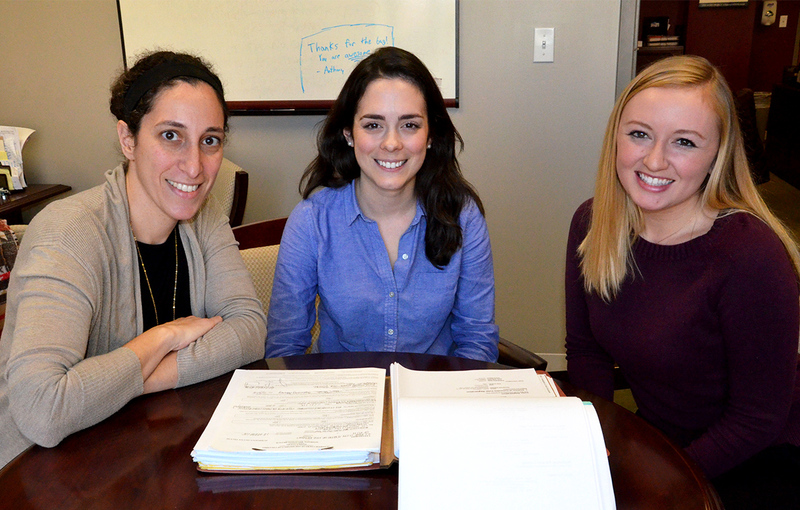 Participating in the rotation, fourth-year medical student Justine Achille (NHS’13, M’19) joined Madelaine Cleghorn (L’19), a third-year Georgetown Law student, in the Health Justice Alliance’s Law Clinic during the fall 2018 semester for an opportunity to both advocate on behalf of Health Justice Alliance clients and become better medical and legal professionals in the process. The families supported by the Health Justice Alliance’s Law Clinic are referred by the KIDS Mobile Medical Clinic, the School Based Health Centers at Anacostia and Roosevelt Senior High Schools, and HOYA Clinic, all operated by the division of community pediatrics at MedStar Georgetown University Hospital. While Achille reviewed the medical history for one of the children in the client family she worked with — who in addition to having special education needs has severe medical needs — Cleghorn researched and counseled the family on the rights and accommodations to which children with special education needs are entitled. Yael Cannon co-founded the Health Justice Alliance with an already extensive background in teaching poverty law, including at the University of New Mexico School of Law, where she was an associate professor. Determined to glean any health concerns that might impact his ability to learn, Achille and Cleghorn then worked together to create an exhaustive list of questions to ask the child’s physician. Caskin oversees the clinic’s holistic care services, including pediatric care, nurse-midwife and behavioral health care, as its medical director and as the associate director of community pediatrics at MedStar Georgetown University Hospital. Later, the students and Cannon accompanied the client family for a meeting at the child’s school about his individualized education program (IEP). Achille and Cleghorn advocated for more in-depth psychological and educational testing to help identify whether the child had any additional needs that needed to be accommodated. They also helped the mother obtain in-school services for her child, such as assistive technology within the classroom. After dozens of additional meetings and phone calls, Achille and Cleghorn’s efforts were successful, as they were able to obtain for the child an IEP that ensures he will receive fair access to the school’s curriculum. In addition to working with Cleghorn during her rotation, Achille also shadowed Ana Caskin, MD, at the School Health Center at Anacostia High School in Ward 8, an underserved area of Washington, D.C., with a large low-income population. 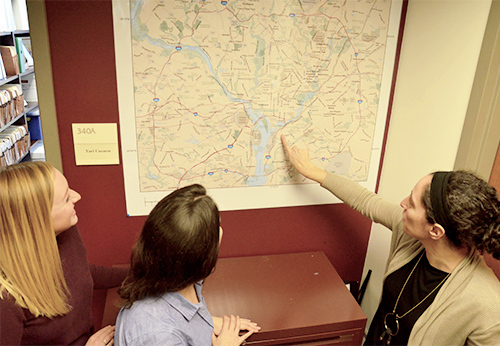 The Health Justice Alliance has been able to address a range of challenges among underserved populations in Washington, D.C., such as homelessness, food insecurity, domestic violence and addiction. Because the clinic exclusively serves the high school students and their children, Achille’s experience shadowing Caskin, who is also the deputy medical director of the Health Justice Alliance, gave her an up-close look at the impact of social determinants of health on at-risk youth. “What I loved so much about my time there was how well the whole team is able to connect with their patients,” said Achille, who first became interested in the areas of public health, medicine, children and families as a human science major at Georgetown’s School of Nursing & Health Studies. 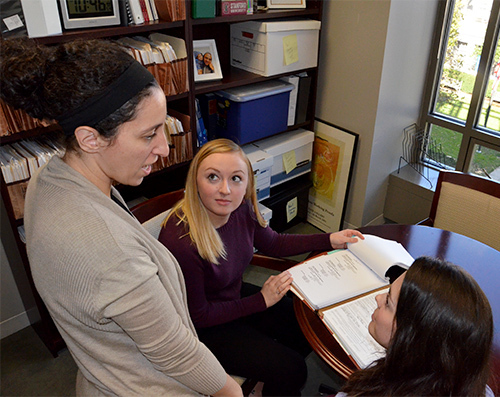 Having forged relationships with clients and patients, law faculty, health providers and others with whom they worked, rotating at the Health Justice Alliance gave both Achille and Cleghorn a series of memorable, educational experiences. “I think this rotation fits right into the type of work that I’ll be doing for the rest of my life,” said Achille, who is pursuing a residency in family medicine, aiming to either stay in the Washington, D.C., area or return to Boston. In addition to shadowing Caskin, Achille’s participation in Law Center seminars, lectures, case rounds and Health Justice Alliance client intake taught her about poverty law and taking a “trauma-informed” approach to patient care. “This is really the first semester I have had a vast amount of experiential learning. Before this, I’d been reading in textbooks and answering questions in class,” said Cleghorn, who likewise, is headed to a Boston law firm following graduation, eager to pursue pro bono opportunities in poverty law. “It’s just so different to come into this sort of setting where I have a real client, a real family, and the work that I do has a direct impact on the challenges they face every day in their lives,” she added.